Going the Full Katy Manning. This post has a couple of Not Safe For Work photos. If that’s likely to cause you issues, please go no further. So here’s the thing. Chuck McKenzie had a Dalek on loan in his shop, Notions Unlimited. I had to go down to Melbourne for a funeral, so I was going to make time to drop in, both to see Chuck and the Dalek. Then a mutual friend, Helen, posed naked with the Dalek, and I realised two things – Chuck was totally okay with the idea, and I was so doing this! 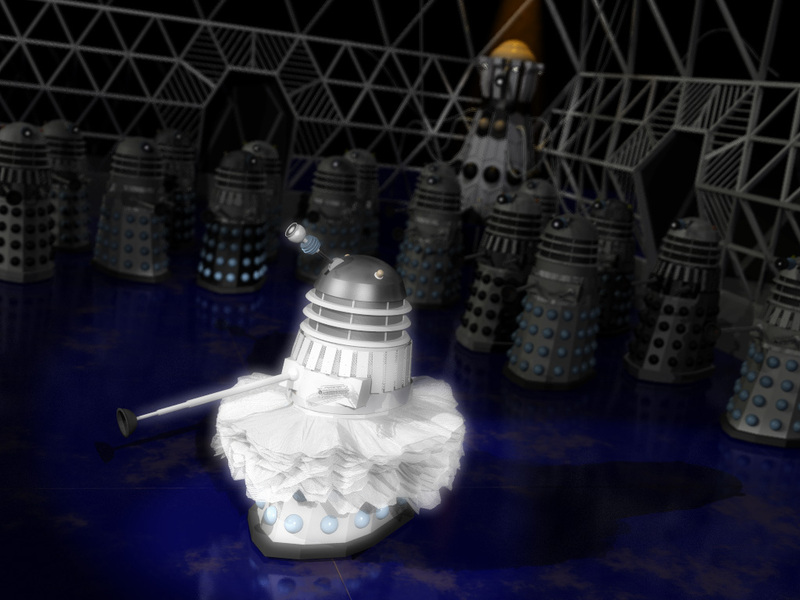 This was not one of the Who3D BBC Project pieces of art, but I wish it had been. This is one of my meandering interludes to the BBC Project posts, rather than me talking about a specific aspect. It’s mostly a way to gather my thoughts and feelings. Every post I do on the BBC Project is hard. Really hard. Part of that is I’m not entirely happy with the job I’m doing. Fairly sure I will have to do a massive errata post at the end. A big chunk of the difficulty is the feeling that, even though it’s just as valid a piece of Doctor Who history as any number of failed attempts to produce movie versions, or bring back the series pre-2005, it feels as if it’s not important to anyone except me. Two things keep me going. One is, I’d like Cliff Bowman to get just a little recognition. Without him, I’d have never had the chance to work on this. Doesn’t matter that in the end it never went anywhere – for a while I was living any fan’s ultimate dream – trying to do their own version of the series. The other is, I’m a fanboy. And like most fans, I find out about this sort of thing and it makes me curious as to what may have been. What if Ridley Scott had ended up working on Dead Planet? What would the 30th Anniversary Special Dark Dimensions have been like? Would Doctor Who Meets Scratchman have been any good? What would a 3D animated pilot or series that got its start using fan talent have been like if it had been produced in-house by BBC Wales, back in 2003?